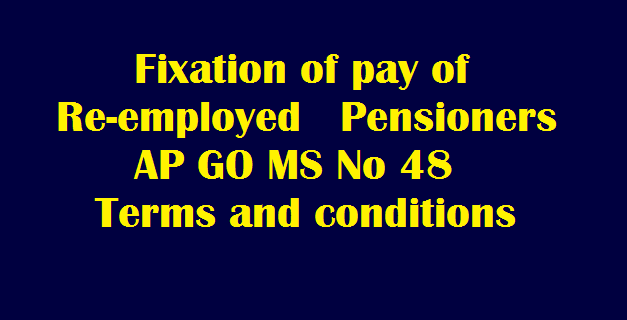 Fixation of pay of Re-employed pensioners AP GO MS No 48 Terms and conditions: AP GO MS No 48 Dated: 23-04-2018 Pensions –Terms and conditions of Re-employed Pensioners. Government have issued orders regarding fixation of pay of Re-employed pensioners and after thorough consideration terms and conditions of reemployment in suppression of all orders issued . Pay , LAST PAY, PENSION, Allowances, Permission to draw pension , Non drawal of Dearness Relief on pension, Term/Duration of Re-employment, Entitlement of leave, Entitlement of leave details are given here. I. Pay:- The re-employed pensioners shall draw last pay drawn minus pension as pay. IV. Non drawal of Dearness Relief on pension: The re-employed pensioners are not eligible for dearness relief on pension during period of re-employment and the pension disbursing officers should obtain a certificate of non-re-employment from the pensioners along with the Life Certificate to be submitted between October and April every year. 3. These orders are applicable to those pensioners who are re-employed against sanctioned posts. These orders may also be extended to those pensioners who are re-appointed without sanctioned posts such as in case of officers on special Duty/Consultants etc., duly defining the terms and conditions relating to facilities such as tour TA,Vehicle etc., that are to be provided for effective discharge of duties.